What do you think of this Two Fisted Beer Mug? Close your eyes and imagine a world where you can pour two beers into two mugs and drink the beers like they were in a single beer mug. For many years, that world just didn't exist. How we made it this far as a society without such a device is something scholars will argue over for many year to come. Freak out no more with the Two Fisted Beer Mug. 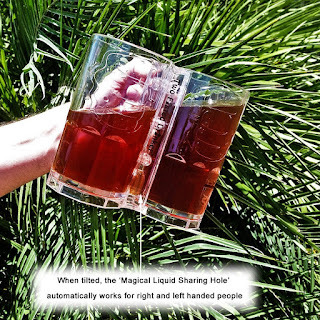 It's patent pending design allows for the sharing of liquid (preferably beer) between the two mugs. But the combinations of uses are only limited to your imagination. Put ice tea in one side and lemonade in the other for a fun Arnold Palmer. How about some vodka on one side and bloody Mary mix on the other for...well, a Bloody Mary! Perfect for tailgating, parties and hanging out in general, you will be the hit of the event with the Two Fisted Beer Mug.